Irish Christmas tree ornament features a leprechaun's hat and shoes. 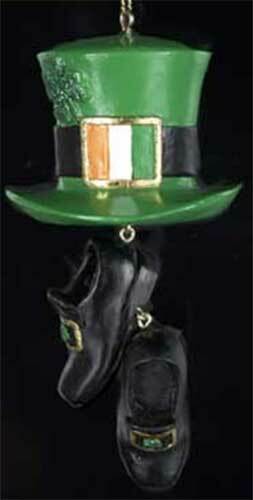 This Irish ornament is a resin design that features a leprechaun's hat and shoes. The leprechaun's hat is enhanced with the Irish flag along with an embossed four leaf clover. The leprechaun's shoes are enhanced with buckles that have gold accenting along with a four leaf clover. The Irish Christmas decoration is gift boxed, complements of The Irish Gift House.